Orlando Health is a prominent Central Florida health system. But prior to 2008, as Orlando Regional Healthcare, it was known primarily for its level-one trauma center, and eight loosely connected hospitals. With great foresight Board and leadership saw the importance of repositioning the organization for the future. Trajectory was a change agent for this transformational, forward-looking rebranding and relaunch – addressing the critical need to create a “health-centered” identity and value proposition, ensuring the organization’s ongoing relevancy. A new name and logo that effectively umbrella’s all facilities and aligns all fully-owned hospitals. Reinforcing the longevity of the organization, while bolstering its relevancy into the future. Our staged, multi-year effort began with building new organization name awareness, and then going deep into individual facilities and service lines. 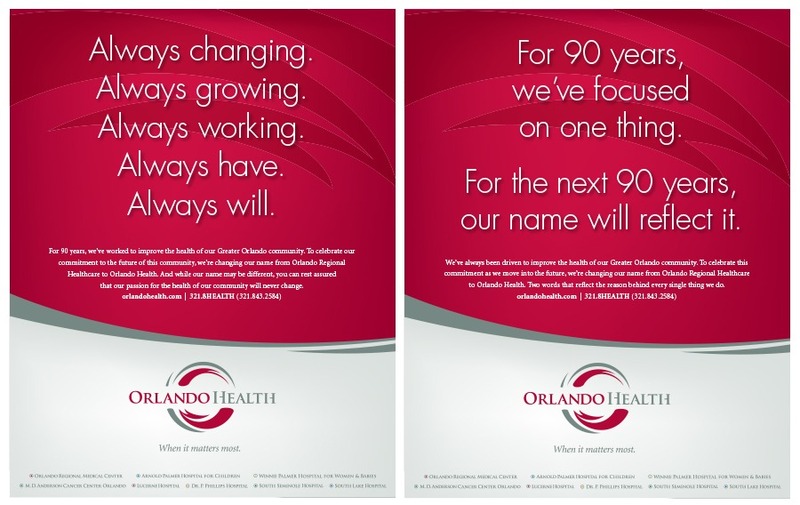 Trajectory’s rebrand of Orlando Health was just the beginning of positive growth and change for the organization. Since 2008, they have experienced enhanced image, growing physician referral, and higher utilization. Years later, Orlando Health continues to extend its reach and impact in new and meaningful ways. Case in point; Orlando Health is the official healthcare partner to the new MLS soccer team – Orlando City Soccer Club. And Orlando Health’s logo (our logo) has made its way to the front of the team’s jerseys.